Tatiana Skripunova from the village of Fedoskino has painted this beautiful box. This artist has a distinctive painting style expressed through the delicate palette that consists of tender pink, lemon, peachy, brown and red tones, and through her artistic aspiration for elegance and beauty. 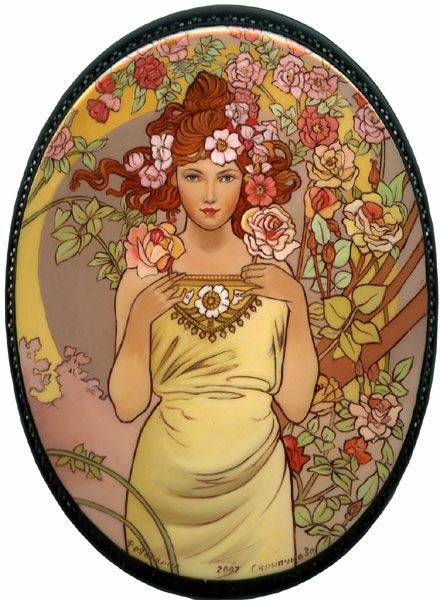 The box depicts Flora - the Roman goddess of flowers and the season of spring. She is a bright nature goddess who symbolizes rebirth, the sweetness of new life, both physical and spiritual. She inspires us to surround ourselves with flowers, breathe in their fragrance, and begin something new! The scene is framed with a silver scan pattern (made of tiny beads hand punched from silver metal sheets, and then glued to the box manually). The box is made out of paper-mache. Black color covers the exterior and red color covers the interior of the box. The lid is hinged at the left and the box rests on a flat bottom. Signed with the artist's name, the village of Fedoskino, and the year of 2007.